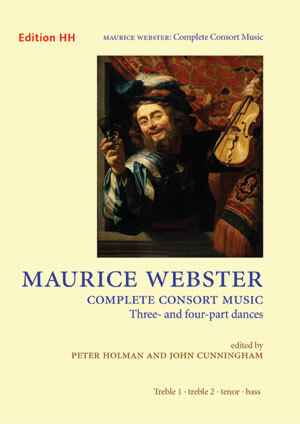 The five three-part (SSB) and nine four-part (SSTB) dances in this edition represent the complete surviving consort music of Maurice Webster. Several of Webster’s pieces were included in Thomas Simpson’s Taffel-Consort (Hamburg, 1621), one of the first collections in Europe to use the SSTB, or ‘string quartet’ scoring. Webster, a skilled composer with a distinctive style, appears to have been the main catalyst for introducing this scoring in dance music to England in the 1620s. The development of this idiom had a significant impact on the music of his contemporaries such as Simon Ives, Charles Coleman and William Lawes, who fully embraced it by the 1630s. Webster probably intended his pieces to be played by a six-part group of two violins, tenor viol or viola (for the four-part pieces), bass viol or bass violin, with two or three theorboes, but other combinations are possible. The theorboes can be omitted or be replaced by a keyboard, and the collection is also suitable for consorts of viols, recorders or cornetts and sackbuts. Here one finds a blend of the scholarly and the modern practical needs of the performer and student that many, more famous publishing houses would do well to emulate. This is exemplified by the offer of an alternative version of the tenor part (using treble clef) as a free download. These traits, in combination with the involvement of editors such as Peter Holman, one of this country's most esteemed scholar-performers, put Edition HH at the forefront of the publication of neglected repertoire.